While I wait for someone (preferably a King) to be a hero in Saturday's Game 5 of the Stanley Cup Final, I was thinking back to my brief, very brief, and somewhat tragic street hockey career. For this nerdy kid growing up in the San Fernando Valley, there was one day when hockey fame was in my sight, only to see it taken away in what I still maintain is the greatest refereeing error in the history of North American sports. Also, it is a great example of what happens when you put adults in charge of kids' games. My friend brought in some of his hockey gear to school for us to see. The big catching glove, the mask decorated with a Spider-Man design, and the large blocker were all big hits. After a time, many of us had our parents go to the local sporting goods stores to pick up street hockey sticks. 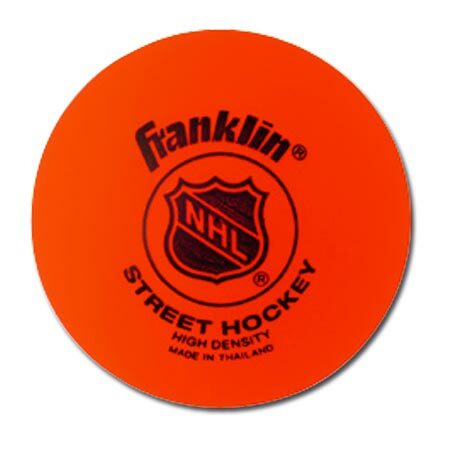 Eventually, a few more kids picked up street hockey balls, which are a little bigger than a baseball and were made of a hard orange plastic, that was designed not to have only minimal bounces. While the thought of loosely supervised 11- and 12-year olds running around the playground wielding sticks and wearing no facial protection would likely not be allowed now, we were able to get away with it. The games were fun and usually competitive. I don't recall anyone getting hurt enough to require a trip to the nurse's office. The nature of the game made it so that even the gawky, unathletic kids like me were able to be somewhat proficient at it. For reasons I can't remember, those of us in the fifth grade felt that we needed to take on the sixth graders in a formal game. It would be a game with features like rules, officials, and someone keeping score on a piece of paper that would give it an air of authority. We would not have actual goals with nets to use. Instead, we were granted the privilege of borrowing traffic cones to set up the goals. Eventually, rules were hashed out and some eighth graders would serve as officials. Each team had to make sure that every player (just the boys played) would see some action during the game, a provision that most of us who had played youth sports of any kind were used to. Although I wasn't a team captain, I sat in with some of my classmates to set up groups of players so that we would have a mixture of someone who could play goalie, some guys who could score, and one or two of the kids who just had to play anyway. At game time, our careful preparations were thrown out the window by our teacher, who decided to form the teams in alphabetical order into groups of six so there "wouldn't be any hard feelings." However, this just served to tick off those of us who had prepared the lineups. But, few decisions in life are harder to appeal than those set down by a Catholic school nun. When the game started, our improvised lineup managed to hold on against the sixth graders' best efforts. Eventually, we just started substituting in whatever players we wanted when we realized that the teachers were not paying much attention to just who was out on the playing area, which was the school's parking lot. Also, all of us (on both teams) were playing in our standard school uniforms of a white shirt and brown pants. I walked off the blacktop to celebrate with my teammates while a new set of players went out to play. Then, I found out some horrifying news The eighth grade refs, after consulting with the teachers, disallowed the goal. It was decided that because the ball took a bad bounce that the goal was "unfair." You might think that the average kid would not take this news well. You would be correct. I was incredibly upset at this. I could not engage in a full blown tantrum because I would have run afoul of my teacher and principal. I started pointing out various times when other sporting events had been decided by bad bounces. They really should not have let me go to the library and read all those sports history books and let me bring up references to the end of the 1924 World Series. It ended up on a bad hop double in the 12th inning of Game 7 by Washington's Earl McNeely over the head of New York third baseman Fred Lindstrom. This line of argument proved to be futile in the face of the older kids complaining about stray pine cones. The call stood. It was no goal. At that point in time, I came to the realization that life is inherently unfair. A good bounce for me was considered a bad bounce for the other team. And bad bounces were "unfair." We were not supposed to win because of "luck." We were supposed to win because, ... well, I didn't know anymore. But, I was pretty sure it wasn't meant for the fifth graders to win. As I recall, the game ended up a 3-3 tie. I didn't score any goals, or even had any more shots. We were hoping to play longer. But, some parent decided that she had to park her car where we were playing even though school wasn't going to let out for another 30 minutes. And, in 1977, parents had less compunction about driving their cars through a group of kids playing in a parking lot than they do now. The street hockey fad in my neighborhood seemed to die out after that game. My stick likely ended up in the garage and eventually in the trash. Or it could have broken. Whatever the case, my street hockey career's one moment of fame came and went in a flash. The lucky bounce that may have made me the most minor of sports celebrities at my school proved to be nothing more than a life lesson about how unfair the world can be. Next blog post: Only in LA: Time to leash dog owners?